We are pleased to announce the winner of the 2018 Early Career Researcher scientific poster competition, Ilaria Frau! Research on the use of microwaves to continuously detect zinc ions in water was the winning scientific poster by Ilaria Frau from the Liverpool John Moores University, who has won the SWIG 2018 Early Career Researcher Competition. Justin Dunning, SWIG Chairman, Ilaria Frau ECR winner, and Rosa Richards, SWIG Programme Manager at the awards ceremony at WWEM 2018. 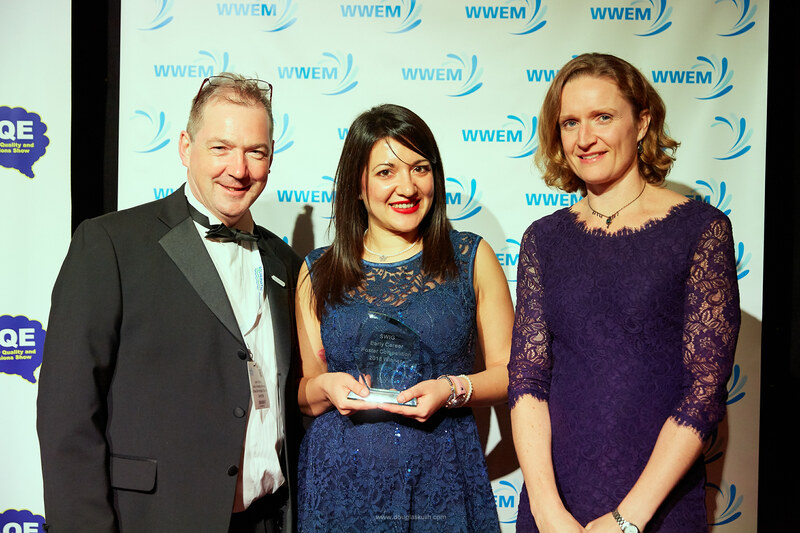 Ilaria was presented with a trophy and cheque for £1,200 during the gala dinner at WWEM2 2018, where she had earlier presented her research in the poster exhibition area entitled ‘Microwaves and Functional Materials: a Novel Method to Continuously Detect Zinc Ions in Water’. This technique could also be adapted to detect other environmental pollutants. Congratulations also go to the winner of the 2nd prize of £500, Francesca Cecinati for her cutting edge research into ‘Radar-gauge rainfall merging with uncertainty: Kriging with External Drift and Non-Stationary Variance (KED-NSV)’. Congratulations also to the winner of the 3rd prize of £200, Jennifer Redmond for her research into a ground breaking use of a molecular flow sensor in ‘Water sensing for in-airway monitoring of ventilated patients’. All posters passing to the final judging phase were displayed at the WWEM 2018 conference and exhibition on 21-22 November, with the top 3 entrants being required to give a short presentation at WWEM. The winner was judged on the poster and presentation, and announced at the WWEM Gala Dinner. The next ECR competition will be held in 2020.